Former Minford standout Cain Madden, who graduated from MHS in 2014, earned a football scholarship following the end of spring practice. Madden, a redshirt junior, could factor into the offensive or defensive line rotations at Marshall going forward. The Marshall University football program is one that holds an outstanding tradition. Randy Moss. Byron Leftwich. Darius Watts. Rakeem Cato. They all played professional football — heck, even starred in it — and they all were a part of teams that won Mid-American Conference or Conference USA Championships. However, a player has to have a special mindset in order to grind away at a scholarship after walking on — knowing full and well that the scholarship may never come. Minford’s Cain Madden has that very mindset, because the redshirt sophomore accomplished something that none of those four Thundering Herd greats can ever lay claim to. 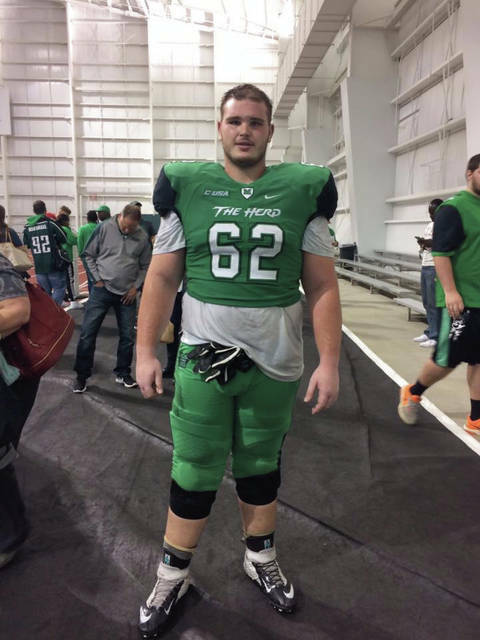 Madden, who was a standout two-way lineman for the Falcons from 2012 to 2015, earned a scholarship after walking on to the Thundering Herd’s football program, his mother, Flora, announced on April 29. For Madden, the opportunity to obtain a full-ride at a Division I football program is an amazing blessing and a huge relief all in one fell swoop. However, greatness, as far as Brent Daniels is concerned, has always been evident in his former player. As an athlete at Minford, Madden, who participated in football and track and field at the school, excelled at both sports. The physically imposing defensive lineman, who grew to be 6-3, 345, ultimately garnered two consecutive All-Ohio honors to end his football career in the sport, and, to this day, holds the school’s second-best mark in the shot put with a throw of 48 feet, 10-and-a-half inches as well as the program’s third-best showing in the discus with a throw of 130 feet, one inch. Madden capped off his strong multi-sport high school career by obtaining an invite to the 71st Annual North-South All-Star Classic in 2016. But as physical as Madden played in the trenches, it was his attention to detail and his improvement from a technique standpoint that caught Daniels’ eye. The best part about Madden? It could very well be his humility. A talented lineman, especially on the defensive side of the football, Madden teamed with Ohio University signee Jared McCray, among others, to form a deep and talented line unit that was arguably the best in the SOC II at the time. But you couldn’t tell, according to Daniels, by simply dealing with him on an everyday basis. But as most people know all too well, the Southeastern Ohio sports scene, at times, gets overlooked. That, however, ultimately turned into Marshall’s gain. At first, the work, expectedly, was a bit overwhelming for the All-State standout, who, instead of seeing himself in the middle of the starting lineup for four years, had to toil away from the bottom of the totem pole. He was redshirted in 2016. After being shifted to the offensive side of the football, Madden toiled away in practices for two seasons, hoping to, and successfully finding, footing thanks to the help of other teammates who took the now 6-3, 319-pound offensive lineman under their wing. Madden then ultimately moved to the beat of his own drum in a successful manner — and that successful manner led to a late-April meeting with the very man who has led the Thundering Herd to 61 victories, five winning seasons, an undefeated bowl record (5-0) and a 2014 Conference USA Championship — Doc Holliday himself. In that meeting, Holliday informed the lineman that he would be put on scholarship for the 2018 season on forward. To earn the so-called ‘PT,’ however, Madden will have to work for it. In all, there are 13 offensive and defensive linemen that are of redshirt junior or redshirt senior eligibility, which will make the Thundering Herd, with seven redshirt sophomore lineman — including Madden — behind the initial 13, exceptionally deep on both sides of the football. The offensive lineman — who could be switched to the defensive side of the football — is no stranger to challenges. However, the simple meaning of having the scholarship is thrilling enough — and one that will allow Madden to focus on football and his classwork instead of having to worry about how ends will be met with the costs of college being a shade over $80,000 for a four-year degree at the school. And that’s Madden’s ultimate goal — to use the game of football as a way to help provide for his family, whether that be through his education via the football scholarship or through the game itself.